Now that Inspirations Magazine issue 61 is officially out, I wanted to share with you the finish on this goldwork and silk embroidery project that I showed you last October. Before the photos, the background information: this project was designed by Margaret Cobleigh, who used it as a guild project to teach some silk shading and goldwork embroidery techniques. After preparing the kits for her guild, she had a couple left over, and I am ever-so-grateful that I had the opportunity to procure one! Margaret also submitted the project to Inspirations Magazine. It’s being published in issue #61, which is just out now. If you already subscribe to Inspirations, then you know that you’ll receive the complete instructions, photos, and the pattern within the magazine. If you decide to buy the kit and you don’t have this issue of the magazine, you’ll also need to buy the issue in order to have the instructions. So that’s how that works. 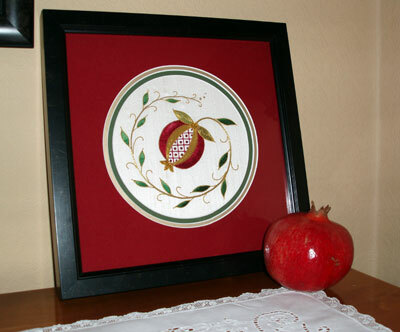 I was first attracted to the pomegranate design when Margaret sent me a photo to show me what she had designed. Well, I was besotted! 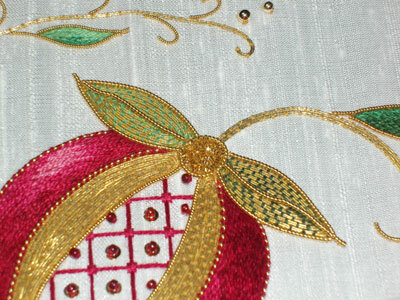 I love everything about this design – I love the colors (the reds are fantastic, and the greens are perfect), I love the goldwork, I love the way the goldwork is arranged and the variety of goldwork techniques, I love (LOVE) the trellis center on the pomegranate, with the beads and spangles… well. Like I said, when I first saw the photo of the project, I was besotted. Another point that I liked about it – it’s not a huge project. It’s small (about 6″ x 6″, I think), so it’s manageable in a reasonable amount of time. 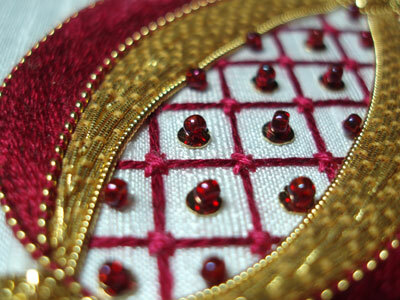 Margaret’s instructions are crystal clear and perfect for someone who wants to try goldwork for the first time. The project is interesting and varied enough for seasoned goldworkers, too. Anyway, I was happy to get one of Margaret’s “leftover” kits… and I started to work on the pomegranate pretty quickly. All told, it didn’t take 3 weeks (maximum) to complete it. Keep in mind, that’s stitching in the evenings and a bit on weekends – I have a full time job and a life, so I wasn’t stitching day in and day out! It was a nice, pleasurable, non-pressured stitching situation. I had decided before I embarked on the project that I would make it as a gift for my niece, who was married in the middle of November. The pomegranate has been a symbol for ages upon ages of new life – so I thought it an appropriate gift. I like angle shots – this isn’t perhaps the best angle shot, but one of my favorite elements of the design is the pomegranate “crown” filled with chip work. Here’s the pomegranate itself. I love the fact that the stitching is shaded with the understanding of a light source from the top left. Notice how the pomegranate, on the top left, is lighter, and on the bottom right side, the top edge is also lighter? The top left leaf is couched in a lighter green as well. Nice, isn’t it? The trellis interior is really my favorite part. I love the pomegranate seeds (beads), and I’m a sucker for trellis couching. I think it’s a beautiful interpretation. The only part that I had real difficulty with was the vein on the leaves. I didn’t remember until after I couched the pearl purl on that it was supposed to be wavy. So I pinched it into a little wave, but it doesn’t look nearly as nice as the leaves on the prototype in the magazine! Finally, here’s the frame job. I had it framed in a custom frame, with all archival materials… the frame is slightly over 11 inches square. It’s black with a gold crackle (in tiny veins) working through it, but that doesn’t show up so well in the photo. It’s triple matted, in green, then gold, then a velvet red mat. The triple matting holds the glass well away from the raised gold and the beads. I was so happy with the way the project turned out that I was loathe to part with it! Apparently the bride loved it, though, so I’m glad did! And thus ends the story of The Golden Pomegranate. I’m sorry…the bride would have gotten a quick piece of crystal at my house…there’s no way I could have given up such treasure! I knew this must have been your project just hinted at in past posts, Mary, when I saw the project in Inspirations 61! Absolutely gorgeous! The frame job is perfect. Mary, I’m so glad you enjoyed the project. You did a wonderful job! oh! I want to get it! It’s gorgeous!!!!! OMG. That is awesome. I love it. Pomegranites are one of my favorite items. This piece is just phenominal. Stunning! Both the design and the execution!! I want to do that! This is absolutely drop-dead gorgeous and your pictures are JUST perfect, Mary. Wow! 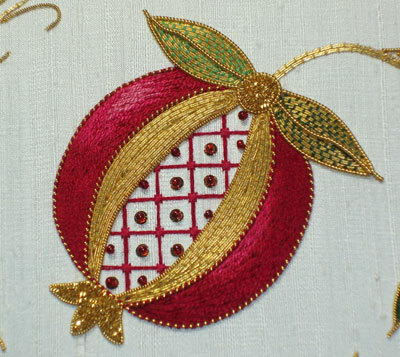 I'm not an embroidery person – but I am a pomegranate person (wrote "Pomegranates", a cookbook published by Ten Speed Press, 2004). The pomegranate piece is exquisite! How can I get one???? It may take me forever to learn how to embroider this, but I would love to try. Beautiful work! A piece of Art! Absolutely stunning! I would gaze at that all day long. 🙂 You are so inspiring Mary. You make me want to expand my embroidery skills from just cross stitch & back stitch! This is a most beautiful and inspiring piece of art. Over and over, my eyes revisit each and every detail. Thank you for sharing these wonderful thoughts and pictures. Oh this is just gorgeous! Me quedo maravillada, Mary…. No tengo palabras para tanta pulcritud. Supongo que la dueña si estará encantada. Un abrazo y gracias por estos post tan soberbios. I am collecting all the materials for this project. However, i am having a heck of the time finding the beads and the 1, 2 and 3mm gold beads and the size 14 pailettes. I looked at Joann’s, Hobby Lobby, and Michaels. I could not find a kit but i was able to find everything except those beads and pailettes. The kits are the way to go for sure. I continue my hunt! Hi, Liz – Most of the stuff for this project, you won’t find at local craft stores. The pailettes (like the goldwork threads) will need to be ordered from a specialty needlework shop that stocks goldwork supplies. You can check Needle in a haystack (www.needlestack.com) in California – they carry some goldwork threads and all of the silks used in the project. I don’t know if they have pailettes in stock, but they can special order for you. Another option is Tania Berlin (berlinembroidery.com) in Canada. 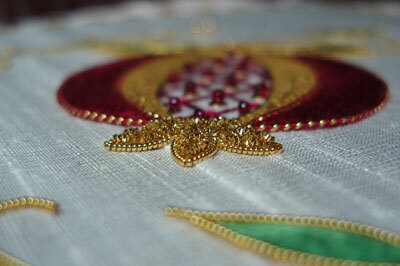 She does carry the whole range of goldwork threads and pailettes, but she doesn’t carry the silks. The beads would probably have to come from somewhere like Caravan beads online or fire mountain gems, or an online bead shop like that. I don’t know what brand of beads they are off the top of my head, though. If they are Mill Hill, you might be able to order them from a Needlework shop, too.